olorado is a rapidly growing state with an expected 92% increase in population by 2050. To support this growth, Colorado needed its Department of Transportation to expand its operations without an accompanying increase in budget. Improving operational efficiency was identified as the way to ensure that Coloradoans could continue to safely and quickly commute and travel within the state. As part of a multi-year strategy, key leaders initiated an improvement initiative that integrated Lean process improvement and Prosci’s research-based change management to deliver measurable efficiency improvements. Read a summary of their story below, or download the full success story. CDOT needed to become more efficient by integrating process improvement and change management capabilities in its underfunded and geographically spread-out department. Through these, CDOT embedded a deep understanding of each person’s role in change, how to build role-based competency and how to position their organization for change success. CDOT adopted the Prosci ADKAR Model as its universal language for change and focused on building awareness and desire for a new way to manage change with this easy-to-understand framework. To overcome the unique challenge of a geographically spread-out department, the CDOT team decided to create a Change Agent Network that would work closely via online meeting platforms and other virtual support mechanisms. This support allowed each change agent to better apply change in their area while also allowing for constant and clear communication about ongoing and upcoming initiatives. CDOT was also recognized by the American Society for Quality and by the Harvard Ash Center for its process improvement program and successful process improvement initiatives. 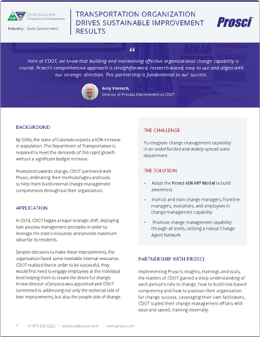 For the full story on how CDOT successfully implemented change management capability and what results it saw, download the success story. Colorado Department of Transportation (CDOT) recognized that in order to meet rising demands without a significant budget increase, they would need to build effective change capability - they chose Prosci to assist them.